I had the good fortune to see Andrew Scott live on stage last year in London for the Simon Stephens play BIRDLAND at the Royal Court Theatre. It was a wonderful experience, one of the best I had in a theatre – ever. 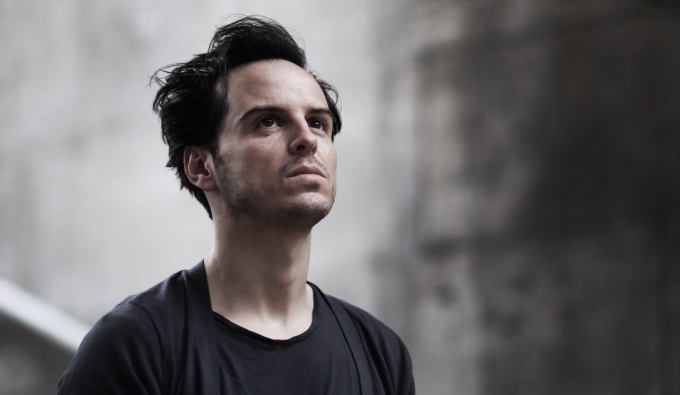 So when I heard, that Andrew Scott would reprise an earlier work by Simon Stephens for the Dublin Theatre Festival, it was a no-brainer – I got tickets and hoped on a plane. Mr. Scott returned to his hometown for 8 performances of SEA WALL, a play written in 2008 with him in mind. The event was at the Project Arts Center, a venue dedicated to producing contemporary, independent art in all forms. It houses two performance spaces and an art gallery and it is a modern but cosy place. The cosiness coming mainly from the lovely staff, who welcome their audience with open arms and a friendly smile. SEA WALL is a 30-minute-monologue of Alex, a photographer, who recounts his life with wife and daughter and their holiday in France at his father-in-law’s. I don’t want to give away too much, but the play moves from little poignant observations to funny anecdotes to a life changing moment. You will be hard pressed to find a more moving and complete experience. Within these 30 minutes you go from laughter and joy to tears and shock and sadness. Andrew Scott is simply marvellous as the narrator. There is no actor there – just Alex. When we entered the venue, a clean and naked space at the Project Arts Center seating around 200 people, he was already there, pacing about and presumably getting in the mindset while everybody took their seats. Some people actually almost bumped into him, not realizing it was the actor and not another audience member. When Andrew Scott started, he had the audience in his hands from the first word. You could feel, that it was a special experience for the actor working in his hometown. And his little winks to the audience regarding the Irish components of the story were well appreciated and drew the most laughter. The scarceness of the surroundings drew me in and left me totally concentrated on the man, the story. There was literally nothing to distract you, no scenery, no lighting, no music. But even if there were – the performance gripped me in a way there was no escaping. I went on Saturday, 28.02.2015 and there were actually two performances on that day. One at seven o’clock and one at eight forty-five. I booked a ticket for both. First of all, because I came there especially for this event and I wanted to make the most of that experience and secondly I was wondering how the performance might differ. That was the most astounding part. Although the text was the same, I could feel a significant shift. The audience reacted in a different way on both occasions and that fueled a different performance from Andrew Scott, one more raw and physically shattered, one more inwardly broken – either was beautiful and true. So thank you Simon Stephens for this moving play and thank you Mr. Scott for this wonderful performance, that I will never forget. After the last performance there was a long line of audience members who wanted to congratulate Andrew Scott and get autographs and photos. And although I can imagine him being exhausted, he stayed until the very last person got what they wanted – as always: not only a class act on stage but also off stage. Note from Editor – Andrew Scott was equally charming at The Colbert after his Birdland performance. For those of you who might have the chance to see Andrew Scott on a stage – go, no run to get tickets! And for those who missed this performance – you are in luck. In doing so, you will not only get a little masterpiece but help the producers to make more content.